Essentially a hernia is an abnormal protrusion of normal body organs or parts through a weak area in the surrounding tissue. Most common hernias are located in the groin and are called inguinal hernia. These	type	of	hernias are more common in males. How do I know I have a Hernia? You may feel a lump or a mass in the lower abdomen or groin. The hernia pops in and out especially when there is increase in the intra abdominal pressure such as when you cough. 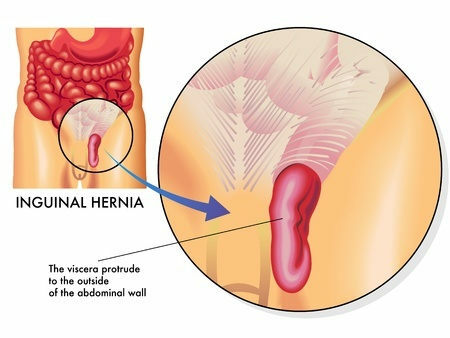 This type of hernia is usually reducible, however if it comes out and does not pop back inside the abdomen then it is called incarcerated hernia. This is a surgical emergency and you need to have urgent surgery procedure to reduce and repair the hernia as there is danger of gangrene or death of the trapped intestine. You need to consult your doctor who can confirm that you have a hernia and needs surgical repair. 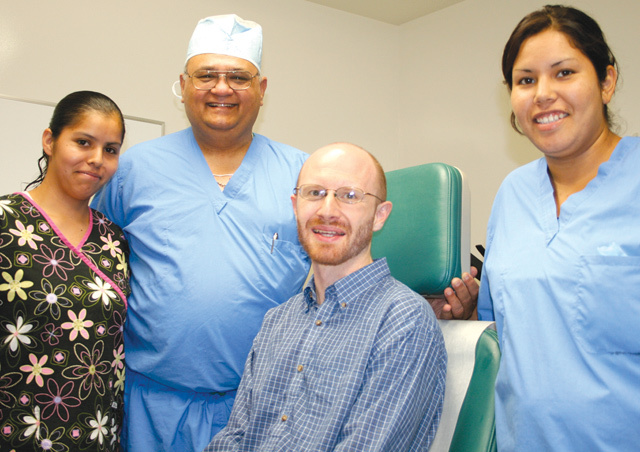 Then your doctor can refer you to a qualified surgeon, such as Dr. Pandya, for surgical repair. How is the Kugel Hernia Patch Repair done? This operation is done to reduce the hernia sac from inside and a specially designed marlex mesh patch is inserted to cover the hernia opening. This patch produces a strong barrier in front of the protruding hernia. Now when ever the intra abdominal pressure goes up the patch prevents the intestine from being pushed out. Click here to read more about Kugel hernia repair. "I actually feel better than I did the first time...even though the first surgery was done by the inventor, I think Dr. Pandya did a better job. The only medication I’m taking for pain is Extra Strength Tylenol. After the surgery I walked to my car and I didn't feel too bad about it." If you have any question regarding Hernia please call (559) 782 8533 to make an appointment with Dr. Pandya.